Schendt Engineering Corp. was the prime consultant for this project. The project generally involved replacement of the HTHW distribution system from the Central Heating Plant to the hospital. The distribution system was approximately 4,000ft in length and traversed a rough terrain with several steep grades as it crossed hills and valleys with elevation changes of approximately 130ft. During the preliminary stage of design, the SEC design team developed equipment schedules of the existing plant and hospital equipment and performed a hydraulic analysis of the HTHW systems within the central heating plant and the distribution system to the Hospital. Based on the hydraulic analysis we determined that the existing 4” piping was not adequately sized to serve the connected load for the Hospital. We also performed a preliminary survey to establish preliminary routing and prepared preliminary plans and profiles. During the final stage of design, the SEC design team potholed to locate existing utilities, performed a detailed survey of the site and detailed out the plan and profile of the distribution system. 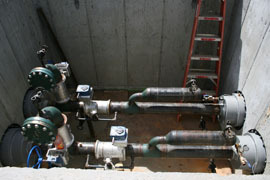 A pipe stress analysis was performed on the piping within the Central Plant and Hospital. 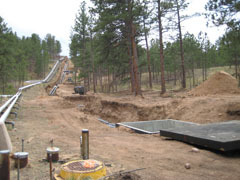 The new distribution system consisted of a Class A conduit system with 6” carrier pipes with 3.5” of mineral wool insulation on the carrier pipe, one inch of polyurethane insulation on the conduit, and an HDPE outer jacket with pressure testable joint closures. 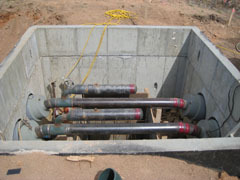 Valve vaults were provided at the high and low points within the system to allow venting of air and facilitate draining of the system. Vault design incorporated ventilation openings, access hatches and ladders and a high point anchor. The work in the central plant required modification to the tie-in points and installation of new distribution pumps with variable frequency drives to vary the speed based on load. The work in the Hospital required replacement of piping in the tunnel and through the mechanical room to the heat exchangers. Existing insulation and paint materials were sampled for asbestos and lead and abatement plans were included for demolition.